We draw from our experience as socially engaged artists and community organizers to create spaces and tools that bring people together around common goals. Whether these goals be utilizing existing public infrastructure, developing a community of cyclists, or gathering public input on design documents, we ask unexpected questions, map results, and present them back to the organizations with with we work. We worked directly with the Heights CDC and the landscape architects to help get the voice of residents into final design decisions for a 1.75 mile multi-use path that is in development. We achieved this through non-traditional approaches to public engagement (think socially engaged art rather than a public meeting). Wabash Valley Art Spaces and Indiana State University invited us to lead a community engagement process to learn how the campus community could and would utilize a developing infrastructure project. Through interviews and an interactive charette, we gathered and synthesized the needs of the community. 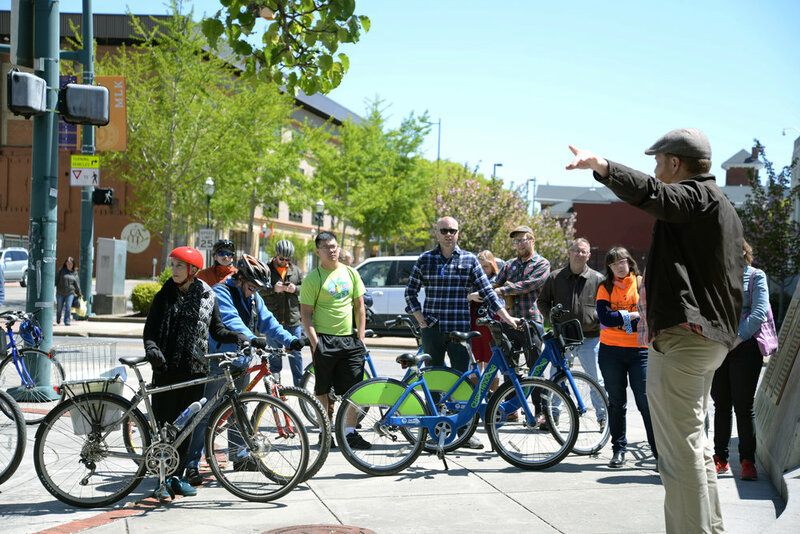 Participants join a bike ride that highlighted local bike infrastructure, developing safe cycling methods, and local innovators’ skills. Along the way, participants shared the knowledge they had with each other. An asynchronous version was available in a newspaper publication that highlighted their skills. We spent a week in residence in North Adams, Massachusetts, asking community members about themselves, their neighborhood, what they know, and what they want to know. The culminating event was a group bicycle ride in partnership with a local bicycle advocacy group. We were invited to create a participatory installation for the Greenway Glow Festival, which seeks to activate a multi-use path in Minneapolis, Minnesota throughout the evening and night hours when public infrastructure is less used by pedestrians and cyclists.